Factory MSRP: $30,333 2019 Toyota Prius XLE Pearl 15" Alloy Wheels, Adaptive Front Lighting System, Advanced Technology Package, All-Weather Floor Liner Package, All-Weather Floor Liners, Cargo Liner, Color Head-Up Display (HUD), Power Tilt/Slide Moonroof w/Sliding Sunshade, Premium Convenience Package. 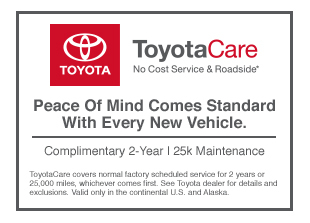 54/50 City/Highway MPG As part of the Toyota family, your exceptional ownership experience starts with ToyotaCare, a no cost maintenance plan with 24-hour roadside assistance.The ToyotaCare plan covers normal factory scheduled service for two years or 25,000 miles, whichever comes first. 24-hour roadside assistance is also included for two years, regardless of mileage. Factory MSRP: $27,703 2019 Toyota Prius LE Blue Door Edge Guards, Smart-Flow Climate Control System Entune Audio, 6.1" Touch Scrn, 6 Spkrs, HandsFree Bluetooth Phone/Music, 3 USB Ports, (1) 12V Outlet Siri Eyes Free Compat 4.2" Color Dual Multi-Info Display Fabric-Trimmed 6-way Adj Dr Seat w/Dr & Psgr pockets & 4-way Adj Psgr Seat,60/40 Split Fold-Down Rear Bench Seat w/Fold-Down Center Armrest Tilt/Tel Steering Whl w/Controls Driver Door Smart Key System Push Button Start w/ Remote Illum. Entry Center Console w/Armrest and Storage Cargo Area Tonneau Cover,Tire Repair Kit ToyotaCare w/3 Years Roadside Assistance 2 Front & 2 Rear Cup Holders, All-Weather Floor Liner Package, All-Weather Floor Liners, Cargo Liner. 52/48 City/Highway MPG As part of the Toyota family, your exceptional ownership experience starts with ToyotaCare, a no cost maintenance plan with 24-hour roadside assistance.The ToyotaCare plan covers normal factory scheduled service for two years or 25,000 miles, whichever comes first. 24-hour roadside assistance is also included for two years, regardless of mileage. Factory MSRP: $27,703 2019 Toyota Prius LE Pearl Smart-Flow Climate Control System Entune Audio, 6.1" Touch Scrn, 6 Spkrs, HandsFree Bluetooth Phone/Music, 3 USB Ports, (1) 12V Outlet Siri Eyes Free Compat 4.2" Color Dual Multi-Info Display Fabric-Trimmed 6-way Adj Dr Seat w/Dr & Psgr pockets & 4-way Adj Psgr Seat,60/40 Split Fold-Down Rear Bench Seat w/Fold-Down Center Armrest Tilt/Tel Steering Whl w/Controls Driver Door Smart Key System Push Button Start w/ Remote Illum. Entry Center Console w/Armrest and Storage Cargo Area Tonneau Cover,Tire Repair Kit ToyotaCare w/3 Years Roadside Assistance 2 Front & 2 Rear Cup Holders, All-Weather Floor Liner Package, All-Weather Floor Liners, Cargo Liner. 52/48 City/Highway MPG As part of the Toyota family, your exceptional ownership experience starts with ToyotaCare, a no cost maintenance plan with 24-hour roadside assistance.The ToyotaCare plan covers normal factory scheduled service for two years or 25,000 miles, whichever comes first. 24-hour roadside assistance is also included for two years, regardless of mileage. Factory MSRP: $47,279 2019 Toyota Highlander Hybrid Limited Black Seating for 7; Perforated Leather Heated & Ventilated Front Seats, 12-way PWR Memory Driver Seat w/Lumbar, 4-way PWR Psgr Seat, 2nd Row Captains & 3rd Row 60/40 Split Fold-Flat Seats w/Recline Integrated 2nd Row Side-Window Sunshades Rear Parking Sonar Entune Premium JBL Audio w/Integrated Nav, 8" Touch Screen w/Backup Camera, AM/FM/CD, 12 Speakers, USB Media Port, 4 USB Charge Ports, BT Phone/Music, Siri Eyes Free,SiriusXM w/3-month Trial, All Weather Floor Liners, All-Weather Floor Liner Package (TMS), Cargo Liner. 29/27 City/Highway MPG As part of the Toyota family, your exceptional ownership experience starts with ToyotaCare, a no cost maintenance plan with 24-hour roadside assistance.The ToyotaCare plan covers normal factory scheduled service for two years or 25,000 miles, whichever comes first. 24-hour roadside assistance is also included for two years, regardless of mileage. Factory MSRP: $51,471 2019 Toyota Highlander Hybrid Limited Platinum Blizzard Pearl 29/27 City/Highway MPG As part of the Toyota family, your exceptional ownership experience starts with ToyotaCare, a no cost maintenance plan with 24-hour roadside assistance.The ToyotaCare plan covers normal factory scheduled service for two years or 25,000 miles, whichever comes first. 24-hour roadside assistance is also included for two years, regardless of mileage. Factory MSRP: $26,368 2019 Toyota Prius LE Blue Door Edge Guards, Alloy Wheel Locks, Entune Audio, 6.1" Touch Scrn, 6 Spkrs, HandsFree Bluetooth Phone/Music, 3 USB Ports, (1) 12V Outlet Siri Eyes Free Compat 4.2" Color Dual Multi-Info Display Fabric-Trimmed 6-way Adj Dr Seat w/Dr & Psgr pockets & 4-way Adj Psgr Seat,60/40 Split Fold-Down Rear Bench Seat w/Fold-Down Center Armrest Tilt/Telescopic Steering Whl w/Controls Driver Door Smart Key System Push Button Start Center Console w/Armrest and Storage Cargo Area Tonneau Cover ToyotaCare w/3 Years Roadside Assistance Temporary Spare Tire Temporary Spare Tire, All-Weather Floor Liner Package, All-Weather Floor Liners, Cargo Liner. 54/50 City/Highway MPG As part of the Toyota family, your exceptional ownership experience starts with ToyotaCare, a no cost maintenance plan with 24-hour roadside assistance.The ToyotaCare plan covers normal factory scheduled service for two years or 25,000 miles, whichever comes first. 24-hour roadside assistance is also included for two years, regardless of mileage. Factory MSRP: $26,368 2019 Toyota Prius LE Black Door Edge Guards, Alloy Wheel Locks, Entune Audio, 6.1" Touch Scrn, 6 Spkrs, HandsFree Bluetooth Phone/Music, 3 USB Ports, (1) 12V Outlet Siri Eyes Free Compat 4.2" Color Dual Multi-Info Display Fabric-Trimmed 6-way Adj Dr Seat w/Dr & Psgr pockets & 4-way Adj Psgr Seat,60/40 Split Fold-Down Rear Bench Seat w/Fold-Down Center Armrest Tilt/Telescopic Steering Whl w/Controls Driver Door Smart Key System Push Button Start Center Console w/Armrest and Storage Cargo Area Tonneau Cover ToyotaCare w/3 Years Roadside Assistance Temporary Spare Tire Temporary Spare Tire, All-Weather Floor Liner Package, All-Weather Floor Liners, Cargo Liner. 54/50 City/Highway MPG As part of the Toyota family, your exceptional ownership experience starts with ToyotaCare, a no cost maintenance plan with 24-hour roadside assistance.The ToyotaCare plan covers normal factory scheduled service for two years or 25,000 miles, whichever comes first. 24-hour roadside assistance is also included for two years, regardless of mileage. Factory MSRP: $26,763 2019 Toyota Prius LE Red Door Edge Guards, Alloy Wheel Locks, Entune Audio, 6.1" Touch Scrn, 6 Spkrs, HandsFree Bluetooth Phone/Music, 3 USB Ports, (1) 12V Outlet Siri Eyes Free Compat 4.2" Color Dual Multi-Info Display Fabric-Trimmed 6-way Adj Dr Seat w/Dr & Psgr pockets & 4-way Adj Psgr Seat,60/40 Split Fold-Down Rear Bench Seat w/Fold-Down Center Armrest Tilt/Telescopic Steering Whl w/Controls Driver Door Smart Key System Push Button Start Center Console w/Armrest and Storage Cargo Area Tonneau Cover ToyotaCare w/3 Years Roadside Assistance Temporary Spare Tire Temporary Spare Tire, All-Weather Floor Liner Package, All-Weather Floor Liners, Cargo Liner. 54/50 City/Highway MPG As part of the Toyota family, your exceptional ownership experience starts with ToyotaCare, a no cost maintenance plan with 24-hour roadside assistance.The ToyotaCare plan covers normal factory scheduled service for two years or 25,000 miles, whichever comes first. 24-hour roadside assistance is also included for two years, regardless of mileage. Factory MSRP: $30,333 2019 Toyota Prius XLE Silver Entune Audio, 6.1" Touch Scrn, 6 Spkrs, HandsFree Bluetooth Phone/Music, 3 USB Ports, (1) 12V Outlet Siri Eyes Free Compat 4.2" Color Dual Multi-Info Display SofTex-Trimmed Heated Fr Pwr Seats w/Dr & Psgr pockets & w/8-Way/lumbar Adj Psgr Seat,60/40 Split Fold-Down Rear Bench Seat w/Fold-Down Center Armrest Tilt/Tel Heated Steering Whl w/Controls 3 Door Smart Key Sys & Push Button Start Center Console w/Armrest and Storage Cargo Area Tonneau Cover Qi-compatible wireless smartphone charge ToyotaCare w/3 Years Roadside Assistance Tire Repair Kit Tire Repair Kit, 15" Alloy Wheels, Adaptive Front Lighting System, Advanced Technology Package, All-Weather Floor Liner Package, All-Weather Floor Liners, Cargo Liner, Color Head-Up Display (HUD), Power Tilt/Slide Moonroof w/Sliding Sunshade, Premium Convenience Package. 54/50 City/Highway MPG As part of the Toyota family, your exceptional ownership experience starts with ToyotaCare, a no cost maintenance plan with 24-hour roadside assistance.The ToyotaCare plan covers normal factory scheduled service for two years or 25,000 miles, whichever comes first. 24-hour roadside assistance is also included for two years, regardless of mileage.